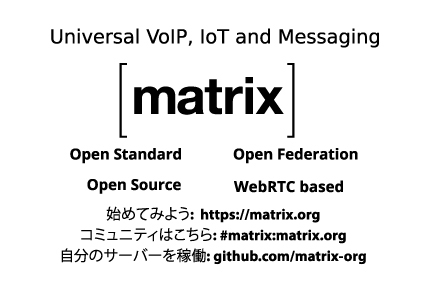 Matrix is on its way to Japan where Kegan is attending the TADHack-mini (Feb 13th and 14th) and WebRTC Conference (Feb 16th and 17th). Kegan will help hackers with their projects during the TADHack, but first, he will give a talk on Matrix and how it can be used. We are again awarding a trossen robot to the best hack using Matrix, and we are as always curious to see what kind of cool and crazy ideas people will come up with! A couple of days later, Kegan will be giving a talk during the WebRTC Conference: "The missing signalling layer for WebRTC". Both of the talks will be live-translated, and there will also be a translator available during the events, so please come and say hello to Kegan-san! As always, we are also available in the Matrix HQ room, via a client like Vector or any other client!